On the hottest day of the year so far at Croft North Yorkshire for round four of the Porsche Club GB Championship Mark Stumpter piloting his Carrera in Class one and Chris Dyer in is 944 S2 in Class 2 made it four wins out of four. The mid-field pack entertained the crowds with a battle for places with Strasse Team mates David Botterill and Richard Ellis racing bumper to bumper. Botterhill who had just finished an outstanding drive the DDMC event to come from 20th on the grid to finish 3rd had to quickly change cars in order to start the Club Championship race. Richard Bennetts Porsche 968 was a surprise to see after the big impact that damaged the car in Saturdays race, The team worked late into Saturday night to get the car back on the grid for Sunday. 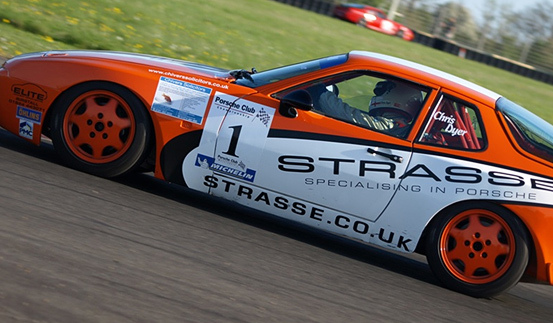 In Class two Chris Dyer of Strasse Racing also made it four from four crossing the finish line 1.40.489 second in front of second place Anthony Oliver in the Porsche 911 SC third place went to Paul Seagrave in the 944 S2. Dyer also had a busy night helping out fellow drivers Paul Ward and Chris Whittle both Sharing the the Yellow 968 C5. Ward and Whittle car had blown a oil pick up pipe in Saturdays GT3 race...Dyer along with White and Ward took the car back to Strasse in Leeds and worked on the car until midnight to have car ready for the race on Sunday.